Adding slices of brie and a little bit of canned cranberry sauce dressed up an average chicken sandwich and gave it some comforting Thanksgiving leftover vibes. 1. Mash avocado with canned cranberry sauce and spread it on whole wheat pita halves (toasted or un-toasted). 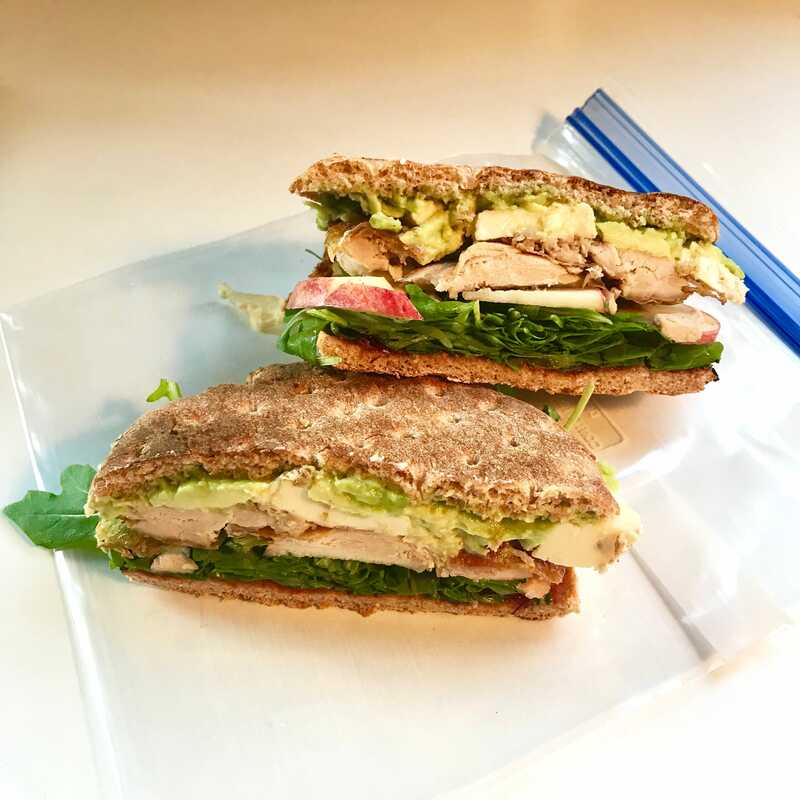 Proceed by layering arugula, rotisserie chicken pieces, brie, and slices apples on one half before adding salt and pepper and sandwiching together. 2. 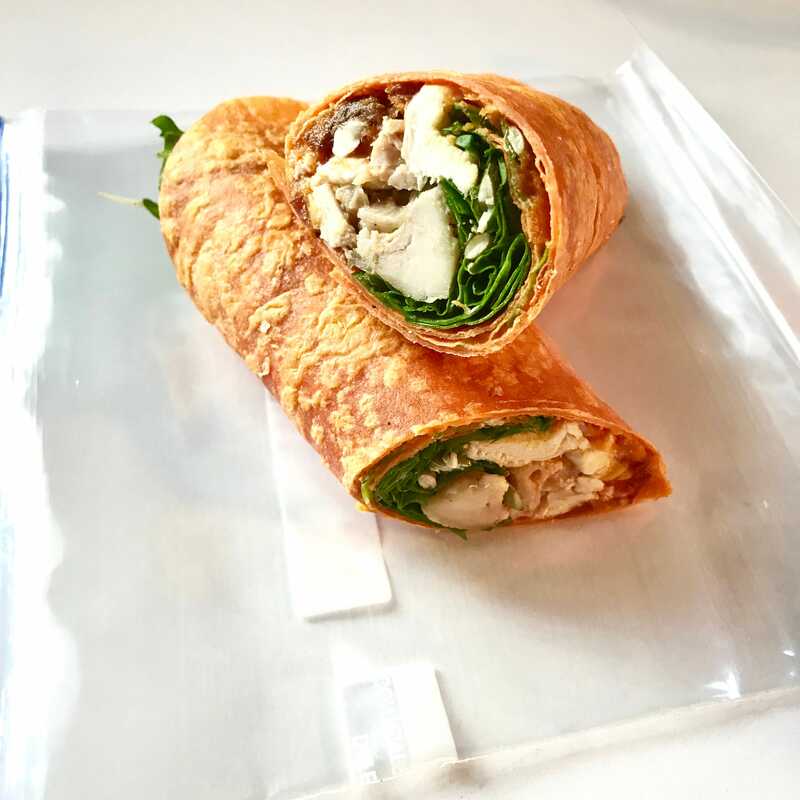 Slice in half and store in a sealable Ziplock bag, wrap with aluminum foil, or place inside a tupperware container. Refrigerate until ready to enjoy. Give your lunchtime wrap an extra layer of comfort flavor and crunch with a pumpkin puree, cranberry sauce, and pepita spread. 1. Mix pumpkin puree, cranberry sauce, and olive oil together in a small bowl before spreading atop sandwich wrap. Season with salt and pepper and then top smeared wrap with chicken, arugula, and pepitas before rolling up. 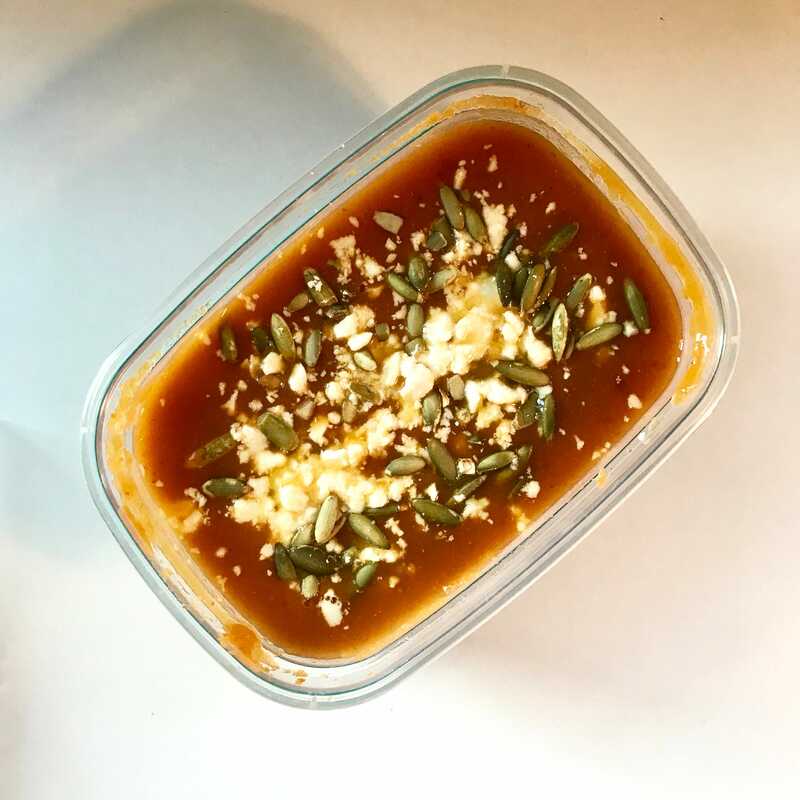 No-effort, seasonal soup is achievable with a little help from a can of pumpkin puree and your microwave! 1. 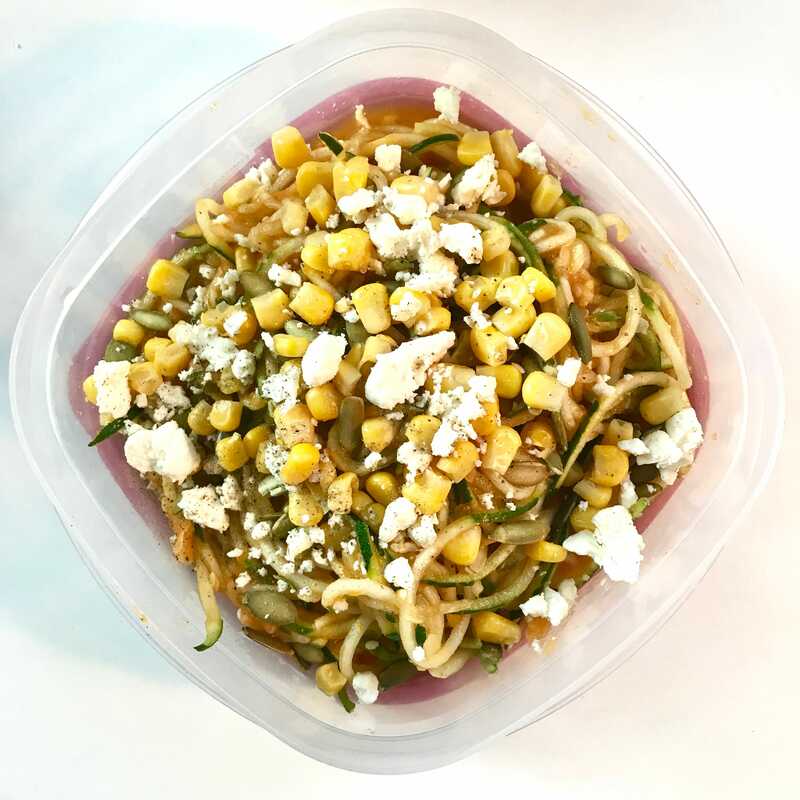 Combine all ingredients (except for pepitas, feta, and salt and pepper) in a microwave safe container and heat on high covered for 1-2 minutes. Remove and stir in salt and pepper to taste. 2. Store inside a tupperware container, refrigerate, and remove to reheat (or enjoy cold) and top with pepitas and feta when ready to enjoy. Pomegranate seeds (a.k.a. winter jewels) are a bright, sweet, and festive addition to what otherwise may have been yet another sad salad situation. 1. 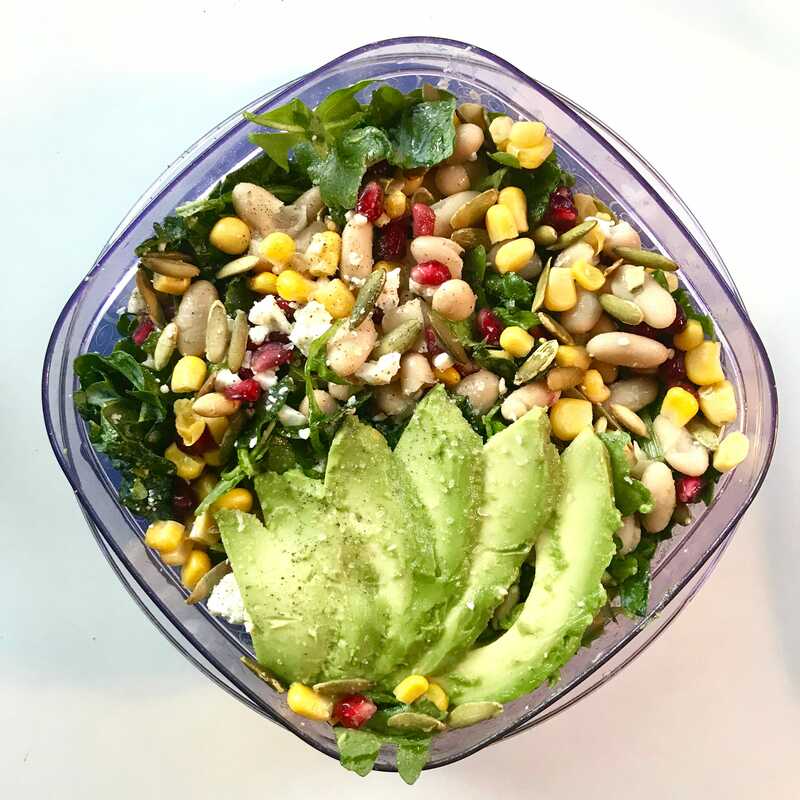 Mix kale and arugula with corn, white beans, feta, pom seeds, and pepitas, then top with sliced avocado and season with salt and pepper. 2. Store inside a tupperware container and refrigerate. When ready to enjoy, remove and dress with olive oil and lemon juice. Enjoy these festive and crunchy zoodles coated in a pumpkin puree sauce either cold or heated up quickly in the microwave. 1. Mix pumpkin puree, olive oil, chile powder, and garlic/onion powder together in a small microwave safe bowl and heat on high for 30 seconds. Remove and coat the zoodles and canned corn with sauce mixture before seasoning with salt and pepper to taste. 2. Store inside a tupperware container and refrigerate. When ready to enjoy, remove and reheat (or enjoy cold) before topping with pepitas and feta. 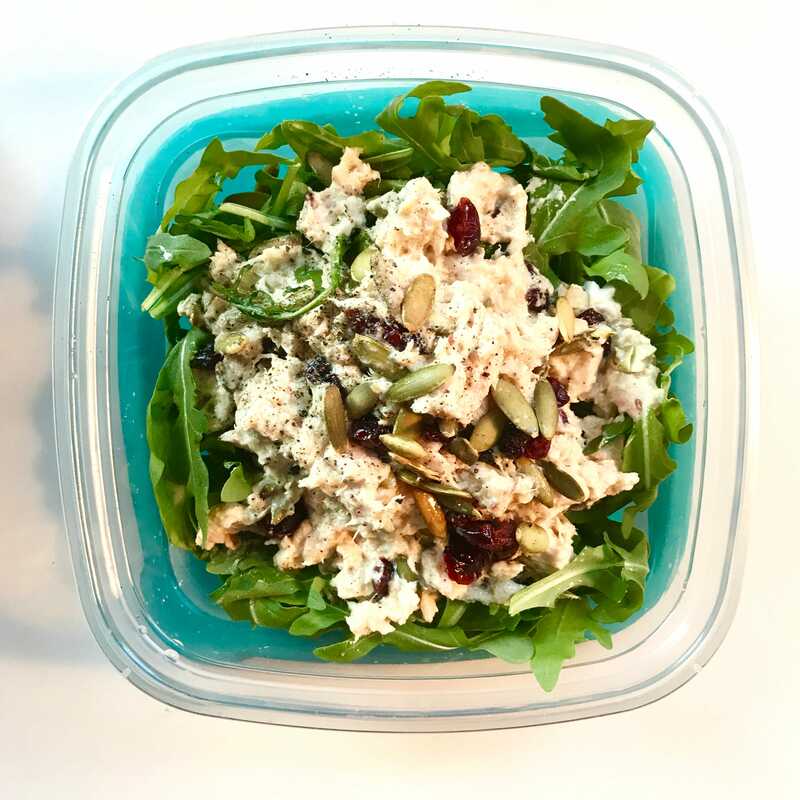 Dress your tuna salad up for the chilly season with an addition of sweet dried cranberries and roasted pepitas. 1. Whisk together Greek yogurt, olive oil, lemon juice and use mixture to coat canned tuna, pepitas, and dried cranberries. 2. Store inside a tupperware container and refrigerate. When ready to enjoy, remove and place atop bed of arugula and season with salt and pepper. Give your usual salad a wintry upgrade by throwing in a mix of your leftover no-cook, cold-weather meal ingredients. 1. 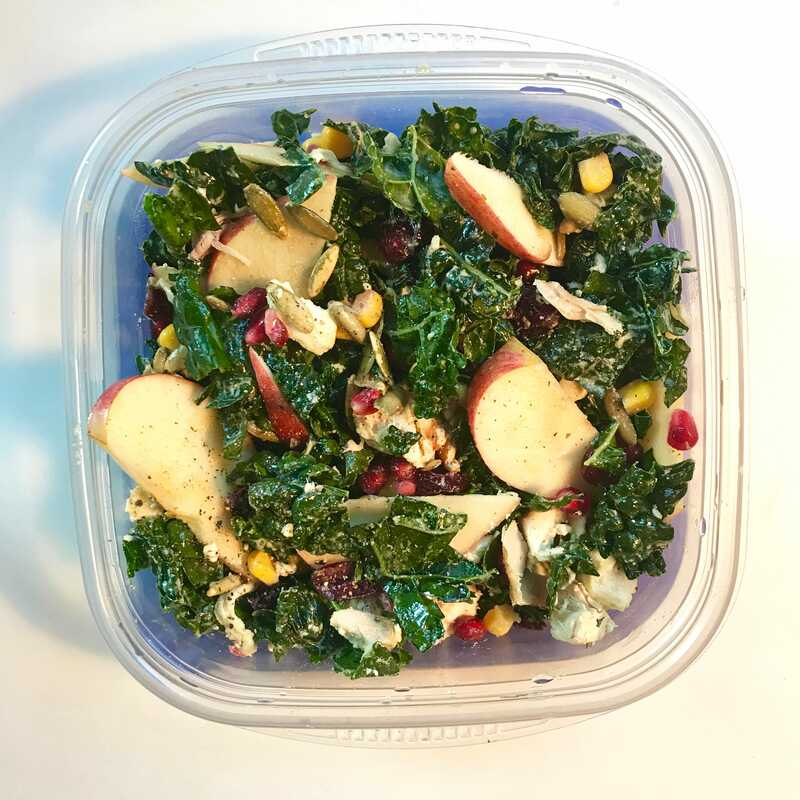 Mix together kale, chicken, corn, pomegranate seeds, pepitas, dried cranberries, and feta and top with apple slices. 2. Store inside a tupperware container and refrigerate. When ready to enjoy, remove and coat with caesar dressing (dijon, lemon juice, olive oil, salt and pepper whisked together). Flavorful ingredients and a variety of textures and seasonings help these easy-prep salads feel just as comforting as traditional winter meals. Try our Apple Harvest Salad or Mixed Green Salad with Apple Pie Vinaigrette.